The new GEKO illuminators designed and produced by Videotec provide excellent lighting, combined with high reliability and make the total savings on maintenance and installation a very attractive option. The light produced by the the illuminators brightens the entire scene evenly, eliminating hotspots and underexposure, for night-time images and secure surveillance of an area. 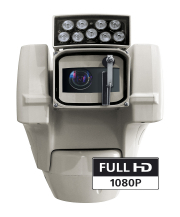 The GEKOs provide clear night vision up to 140m, in an indoor or outdoor environment. The range includes models with 850nm and 940nm wavelength with angles of 10°, 30° or 60°. GEKO illuminators are 8 times more efficient than traditional lighting, using only 12% of the electrical power. There are no gases, no filaments and no moving parts. It takes 50 incandescent light bulbs or 8 fluorescent lamps to equal the life span of 1 LED light bulb. Moreover the GEKOs can operate in an extremely varied temperature range, as low as -50°C up to 60°C and still maintain their long term reliability. With Geko's long life span, the relative power used for their production is reduced and therefore reduces the pollution from energy production. With an average life expectancy of 11 years (less than 6 months for normal bulbs), they make the total savings on maintenance and installation an interesting option.